We’ve brought together resources to help you make sure pupils with special educational needs and disabilities (SEND) thrive at your school. The Children and Families Act 2014 reformed the special educational needs and disability (SEND) system. Our summary of the SEND Code of Practice is a good place to start if you need to get up to speed. What is governors' role in SEN? Governing bodies have a number of duties related to SEN under the Children and Families Act 2014. We also look at how governors can comply with SEND legislation. The Code of Practice advises that all governing bodies have a member of the governing body or committee with specific oversight of the school's arrangements for SEND. There is no set description of this role, but we set out suggestions in our article on the role of the special educational needs and disability (SEND) governor. 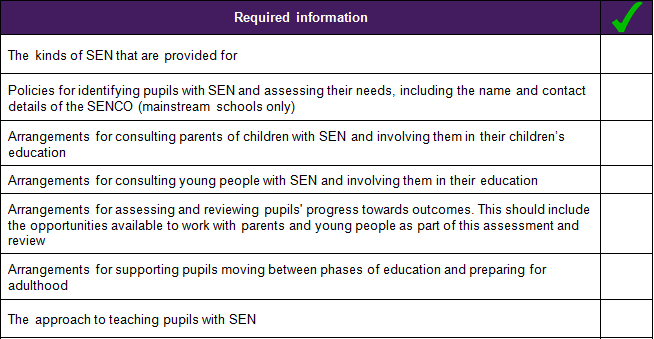 Schools are required to publish an SEN information report which sets out how to implement their SEN policy. The SEN policy does not have to be a separate standalone document. We have created two checklists to help you review your SEN documents: one for the information report and one for the SEN policy. You can download these from the links below. 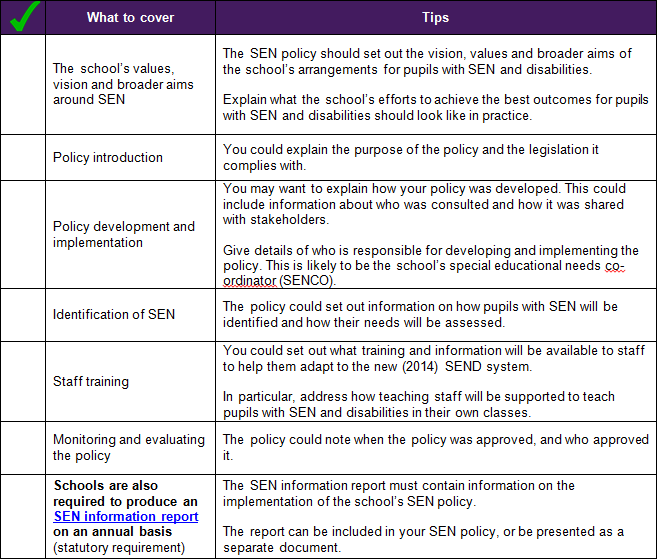 As you can see, the SEN information report looks at what must be covered, while the SEN policy checklist contains suggestions of what to cover as well as best practice tips. You will also find more information and examples in our article on SEN policies. Schools must also produce an accessibility plan under the Equality Act 2010. In our article on accessibility plans you will find a checklist for what to include, examples from schools and advice on publishing and reviewing the plan. SEN funding for mainstream schools is split into three main elements: the basic entitlement, the notional SEN budget and top-up funding. Our QuickRead on funding for pupils with SEN gives an overview of the system. Ofsted inspection: SEN provision How is SEN evaluated in an Ofsted inspection? We outline how special educational needs (SEN) provision is evaluated according to the inspection handbook. We also relay advice on how a link governor for SEN could prepare for inspection. Questions from Ofsted on SEN What questions might Ofsted ask governors about SEN? One of The Key's associate education experts suggests questions that Ofsted inspectors may ask about the school's special educational needs (SEN) provision. You will also find information on how Ofsted assesses outcomes for pupils with SEN.